Pen Boutique Sizzling Summer Contest! Tell us what you did socially encouraging this summer! 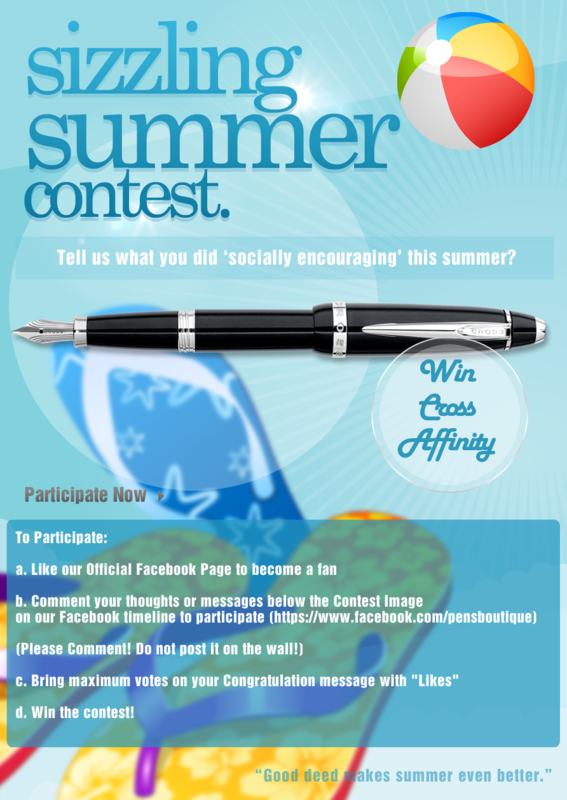 Share your exhilarating summer experience and win CROSS FOUNTAIN PEN! Like our Official Facebook Page to become a fan. Share the exhilarating social experience you had this summer with us. Something more to rejoice and celebrate with. With the summer at its peak, everyone is sure to be making beautiful memories. What socially exhilarating experiences did you have this summer? Share with us and spread love while taking part in "Sizzling Summer Contest" hosted by Pen Boutique.Wishing everyone a sizzling summer. We encourage our customers and well wishers to participate, enjoy and win this exciting Contest. The participation will be transparent as it will be visible to all on Facebook. The winner of this contest will be announced on our Timeline and Pen Boutique blog (blog.penboutique.com) upon the completion of the contest deadline. Out of all the participants with Correct Predictions, One Lucky Winner will be chosen randomly by the system. The name of the winner will be declared in the contest spot as well as she/he will be contacted through the Facebook profile used to participate. All the citizens from USA with valid Facebook ID are encouraged to participate. International customers are welcome to participate but shipping will be additional and you can also add it free to your any pending orders. 1.) This giveaway/contest is void where prohibited by law. The contestants assume the total responsibility of knowing their local laws in regard to "Sizzling Summer Contest" Contest and are subject to any local, state, national or international laws. Friendship Circle accepts no responsibility for making these individual legal determinations. 8.) Winners name may be used on future Pen Boutique, Limited, USA, marketing media, including, but not limited to Facebook, website & blog. Share your Exhilarating Experience. Spread Love. When leaving a job 15 years ago, I was fortunate to receive a Montblanc Meisterstuck Classique Rollerball as a parting gift. I graciously thanked everyone for such a thoughtful present. I enjoyed using the pen and felt regal and important when signing checks and writing letters. 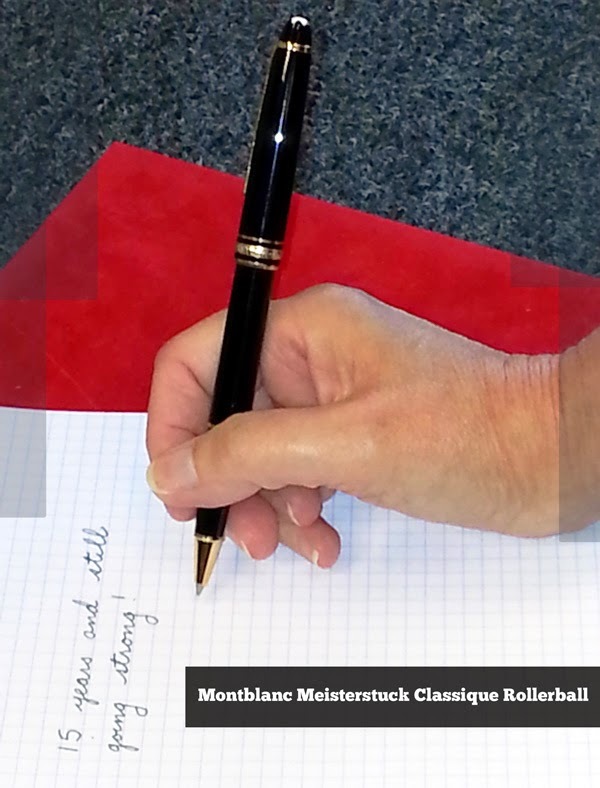 With such an elegant pen I was prone to send more letters and cards to family & friends. I actually looked forward to Christmas when writing out my holiday cards. I had an excuse to sign my name and address envelopes multiple times with my fine writing instrument! Fast forward to present day. I still have my Classique. It still writes as well and looks as good as the day I received it. I continue to get a kick out of scripting letters, keeping in the back of my mind that I am carrying on a tradition. A tradition for composing thoughts and sharing them. A tradition that encourages one to be creative. One would think that amidst all the, wars, conquests, political intrigue and endless scandals, someone in Europe would have thought to climb to the top of the continent’s highest mountain. (For the fun of it if nothing else, as mountain-climbing is a delightful hobby.) This particular mountain sits directly on the French-Italian border in the Alps and remained completely unconquered for centuries. Vague interest in climbing the mountain began around the middle of the 18th century, but it was not until 1760 when Horace-Bénédict de Saussure, a Swiss mountain-climber, sparked a European-wide obsession by announcing that he would give a monetary reward to the first person to climb the mountain. Immediately, untold attempts were made to reach the top of the mountain’s mysterious peak that had yet to see a trace of human life. On August 8th, 1786 Jacques Balmot, a Savoyan mountain guide, and Michel-Gabriel Paccard, a Savoyan doctor and alpinist, were the first ones to successfully reach the crown of this natural phenomenon. They reached the peak of Mont Blanc; or, as the Italians call it, Monte Bianco. For over a century, the Montblanc Company has made some of the world’s finest pens. Their name has been synonymous with craftsmanship, expertise and innovative design. Montblanc has always taken pride in its namesake by incorporating aspects of the great mountain into nearly all their pen designs. In fact, their very logo – a rounded six-pointed white star – represents Mont Blanc’s six glaciers and snow-capped peak. The number 4810 – the height of the mountain – occurs frequently in their collections, whether it’s a simple engraving onto the pens or the quantity of a collection. This year, Montblanc has decided to pay a more direct tribute by giving Mont Blanc its very own collection. The new “Montblanc Meisterstück: Tribute to the Mont Blanc” collection is a timeless compilation of the finest skill, artistry and care that European craftsmanship can produce. Every aspect of this new collection – from the barrels to the nibs, from the cartridges to the clips, and from the emblem to the engravings – contains components that are carefully selected by master craftsmen. Each of mont blanc pens is created with a special diligence and dedication that marks each pen as a Meisterstück – a masterpiece. By their very nature pens are common and unassuming, but Mont blanc has turned these simple instruments into works of art that would put the finest jewelry to shame. To begin, the Montblanc emblem at the top of each pen is carved from beautiful, luminescent snow quartz. This is the only Montblanc collection that uses these precious minerals in the emblem. The pure-white, marble design represents the perfect, eternal snow that sits undisturbed at Mont Blanc’s peak. As for the barrel design, Montblanc took inspiration from the exact moment when sunlight reflects off the sleek glacial ice that covers Mont Blanc. To replicate this priceless reflection of nature, the pen barrels have a snow-white lacquering that is shined to a high, crystal-like gloss. Montblanc Meisterstuck Tribute to the Mont blanc fountain pen has a stunning 18k rhodium-plated nib that is just as captivating as it is unique. These exquisite accents alone would make the pen almost prettier than the mountain it represents, but Montblanc has never been satisfied with excellence when they can hear perfection echoing from the mountain peaks. To answer perfection’s call, Montblanc has added a special element to the metal foreparts of their pens. A panoramic view of the Mont Blanc massif – for those of you who are not mountain-savvy, a massif is a group of mountains that form a specific mountain range – is engraved into the foreparts’ platinum-plating. There is an inscription above the image that lists some of the tallest and most famous peaks of the massif and their altitudes. With arrows pointing to the mountain it represents, the labels read: Mont Blanc (4810 m), Dômes de Miage (3670 m), Aig. de la Bérangère (3425 m), Aiguille de Tré la Tête (3930 m), Aig. de la Lex Blanche (3697 m), Aiguille des Glaciers (3817 m), Glacier de Tré la Tête, Dôme du Goûter (4304 m) and Aig. de Bionnassay (4052 m). These informations are laser engraved on both Fountain pen and Rollerball pen quite visibly unlike the ballpoint pen due to the lack of grip section in the ballpoint pen. The beautifully simplistic text and artfully engraved mountains shimmer incandescently in the metal’s matt silken sheen. The foreparts are available in two distinct colors. Whether it’s pale white gold, reminiscent of frozen winter skies, or subtle rose gold, a color that evokes the image of a faded sunset, each theme will compliment the other accents of the pen to create an instrument of awe-inspiring beauty. There is no finer or more reliable companion than a pen, and there is no finer pen than those in the Tribute to the Mont Blanc collection. These pens transmit an air of grace, quality and prestige that cannot be duplicated. They are impeccable, everlasting masterpieces that will become the crown jewels of any pen enthusiast’s collection. In 1786, two gentlemen set forth with a desire to achieve what was previously an unthinkable, inhuman feat. This year, Montblanc set forth with a similar desire, and excluding the mountain in itself, these visionaries have one important thing in common: they have achieved the pinnacle of greatness. During the 15th century, the countries of Europe began to compete with each other on a global scale. It’s not like they hadn’t been competing before this particular century, it’s just that the insurgent competition over economic, military, philosophical, cultural and religious dominance over their neighbors was enough to make the Cold War look like the Lukewarm War, or the Room Temperature War. The powerhouses of England, Spain and France (Pre-Reformation France, anyway), Portugal and Italy were desperately trying to outpace one another, and all of the wealth that was being accumulated with the colonization of Africa only spurred their imperialism at a more feverish pace. With all their advancements and intellectual societies, however, Europeans were still terrified that if they sailed too far off the coast of Lisbon they would fall off the face of the earth. Christoffa Corombo, more famously known in the Western World as Christopher Columbus, wasn’t so easily scared. He was sure that instead of sailing all the way around Africa, there was a much shorter path to the wealthy trade routes and exotic materials found in India. So, he decided to sail west in search of India; an idea that, within the European world, was thought of as utter stupidity. In fact, it took the native Italian two years of lobbying to the Spanish King and Queen for ships for the voyage, and in the end they never expected to see him again. To the amazement of everyone in Europe, he did come back, and along with his sons, Columbus made three more voyages across the sea. What immortalized him in history however, is his discovery and subsequent exploration of a new supercontinent. Now, don’t let anyone tell you that he was the first European to discover the Americas (that honor belongs to Leif Ericson of Norway, who discovered what is believed to be Newfoundland, Canada over 500 years before Columbus was even born) but he made the first lasting European contact with America; it was the genesis of a whole new era in colonialism. Still, America is not quite India, and finding the latter was the point of the entire trip. Even still, Columbus christened the natives he met indios (Spanish for “Indians”) and whether that was out of embarrassment or ignorance is up for debate. 2012 marks the 500th anniversary of Amerigo’s death, and one of the world’s most renowned pen companies that makes its home in his native land did not do something to commemorate his accomplishments. Not to worry though, Visconti’s Amerigo Vespucci Marine Bronze Limited Edition has taken symbolic events from Vespucci’s life and the famous 1507 map of the continent and effortlessly interlaced them into a pen of astonishing perfection. It would have been impossible (and a serious pain to look at) to reproduce the entire map upon a pen, so there are only certain, key sections depicting Europe and America. The images are engraved upon the cap and barrel’s ivory surface using Visconti’s unique scrimshaw technique. Scrimshaw is the delicate, precision-based art of scratching designs and images upon ivory, bone and other hard surfaces. Engraved into a dramatic light-dark design reminiscent of chiaroscuro, the final results are simply astonishing. Topping off this pinnacle of Italian design is a 23k dreamtouch palladium nib fueled by a power filler. The pen is presented in a specially designed, carved wooden box in the form of an intricately designed astrolabe. (And no, I’m still not sure what that is.) The Visconti Amerigo Vespucci is a true work of art, and a fine testament to a man who made an unequivocally groundbreaking impact upon the history of human civilization. With a simple and durable style, the Pilot Metropolitan fountain pen is an excellent choice for someone looking for an affordable and reliable fountain pen for everyday use. With a sturdy metal body and steel nib, it is great for everyday use. This particular pen has a fine Japanese steel nib, while a medium nib is also available. The fine nib does the job with a surprising glide. Definitely a fine point, it is slightly scratchy without being abrasive or skipping. The pen posts well, has an average weight, and a good balance. The standard length and slightly rounded body make it comfortable to grip and easy to carry. 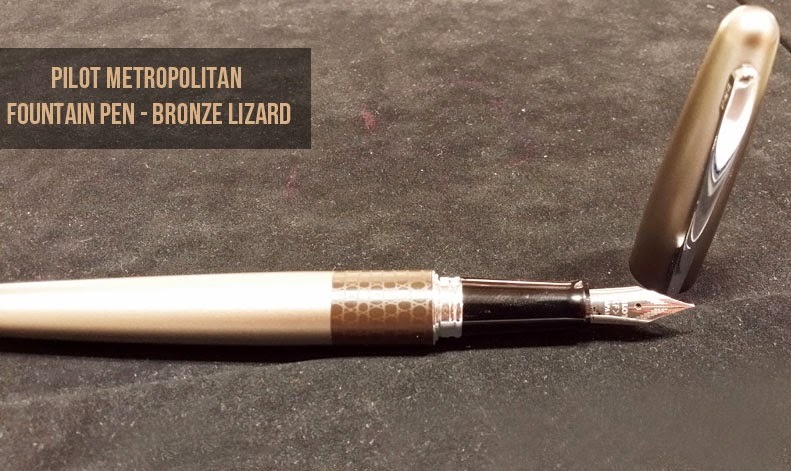 The Pilot Metropolitan Lizard features a stylish matte gold finish and the subtle lizard print on the front of the barrel. There are an array of animal prints and colors to choose to match your personality! Practical yet with a simple sophistication, the Pilot Metropolitanis an extremely well priced pen that is perfect for beginners and well appreciated by experienced fountain pen writers. Want to know about various pens and experience the world of ink? Visit our store at Montgomery Mall , Bethesda or ask a comment and will reply.